Take 2 capsules a day during a meal. It is recommended to use for a few weeks (6-8 weeks). The preparation may constitute a perfect element of dietary supplementation among sportsmen and elderly people, who are in the group of increased risk of fractures and injuries. 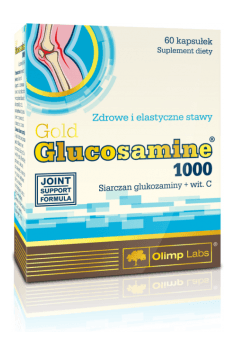 Glucosamine demonstrates its effect only after 3-6 months of systematic use. In order to increase the preparation’s effectiveness and its positive influence on joint inflammations, it may be combined with e.g. chondroitin or Boswelia serrata extract. Remember to take the preparation around meals, preferably after a meal.